A combination of factors – the unearthly hour, an inability to read small print, the herding of cats that constitutes trying to get the family in the car at dawn – meant that I was cutting it very fine on a recent trip to France. Unable to locate my pre-booked parking spot (yes, tempers did fray), I ended up trying Long Term at Terminal 5. Full. They did give me an upgrade to Business, which promised to be expensive, but not as eye-wateringly so as the daily rack rate. 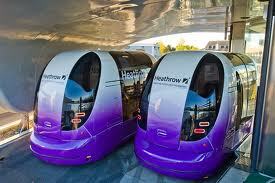 However, it did give me a chance to try the Heathrow Pod, a personal transport system that, a few years ago, you might have considered a prop out of Minority Report. Basically they are individual, driverless little metal cylinder, like a miniature light railway, which take you from the Business area right to T5. Which means no waiting around for transfer buses and a positive wow for the kids. They were even looking forward to the return trip on the way back all the way through the holiday. It was, I have to say, the most expensive little rollercoaster I have ever been on, but if you can stretch to Business, it’s the best transfer, walking apart, I have ever experienced. The normal rate is about £31 a day, but you can save on that with Holiday Extras (0800-083 8754), which has Business T5 for a three-day weekend for £50; a week is £115. This entry was posted in Travel and tagged airports, parking, T5, Travel on September 1, 2013 by Robert Ryan.